If you have not been to The Official Online Store for Barack Obama for President Campaign, you don’t know what you are missing! It has become far more stylish with the launch of the Runway for Change collection featuring t-shirts, tote bags and jewelry from some of your favorite designers. I was surprised to see t-shirts designed by Shawn “Jay-Z” Carter, Beyonce and Tina Knowles, Tory Burch, Nanette Lepore, Russell Simmons, Pharrell Williams, Tracy Reese, Vera Wang, Juicy Couture, Zac Posen, and Narcisco Rodriguez. Did I mention the tote bags? To the left is the Change is Awesome Tote by Rag and Bone. 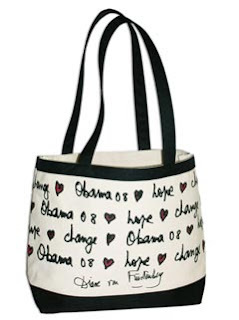 Visit The Official Online Store for Barack Obama for President Campaign to see tote bags by Marc Jacobs and Isaac Mizrahi. All bags are Union made in the USA and reasonably priced around $75.00. Please register to vote! The first bag rocks! I want one.